Corn. 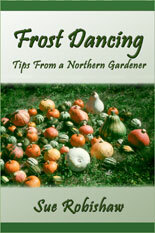 In some ways it is one of my easiest crops to grow, and in others the most frustrating -- thanks to its popularity. Raccoons. They are such interesting creatures. I have to respect their ingenuity even when moaning and swearing at their incredible skills. We all love corn, and we all keep going after the goal of a good harvest. It's worth it. I suppose Nature gets pretty tired of us whining about it being too cold or too hot, too wet or too dry, so she simply hands us all of that in one season, and one cant help but wonder what shell do next year. The growing season of 1997 wasnt the best, it wasnt the worst, here in our low U.P. garden. The corn was late so I didnt get a dry corn crop, but I managed to harvest, and dry, a good amount of green corn, in spite of the raccoons getting past our electric fence. Dried green corn is one of my favorite garden preserves. You can use any kind of corn, sweet or field. When it is at the fresh eating stage steam cook the ears about 10 minutes, just as you would for eating, then cut off the kernels and dry, preferably in a solar dryer. It takes only one or two good sunny days to dry. In the winter throw a handful or so into your dry bean dishes, or soups or stews, for some delicious eating. Normally I grow my own mixed variety of (mostly) flour corn, eating and drying it green at the proper time, letting the rest mature and dry down for grinding. But we’d had a number of good dry corn years, and I had plenty of grinding corn. So I dug out all my old, leftover sweet corn seed and planted that, harvesting all in the green stage for eating and drying. And it was a great year. For the first time, we have plenty of dried green corn—and is that nice! Just rehydrate, and you have the freshest tasting corn in the middle of winter. No frozen or canned corn can compete. These were all open pollinated, old fashioned flavor, sweet corns—and some very nice varieties, too. My favorite, and best, is Simonet, with Fisher’s Earliest close behind. Double Standard and Ashworth are also good, Ashworth being the earliest of the lot, Double Standard the latest. The diversity was nice because it spread the eating and the harvest over a long time period. I still like the green stage of my regular grinding corn (mostly flour varieties) for eating and drying, but it was nice not to worry about which ears to save for maturing for corn meal/flour and which to pick green. We lost a few to a raccoon, but got the electric fence up in time to harvest most ourselves. This should have been a good year for the corn with all that hot weather. I've been growing my own cross of a mixture of short season, open pollinated, sweet corns so I have a lot of diversity. And I continue to plant early, especially when I want the corn to mature so I can save seed, as was my want this year. Some years it works, some not. This year a couple of late June frosts set them back pretty good. Then in early July I started seeing a lot of damage by stem borers -- a beautiful plant cut off or broken off at the base. And a great deal of rough edged holes on leaves and stems. Another new experience -- wonderful. I researched as I could, without finding much encouragement for successfully combating these guys at this late date. So I thought about it, sprayed the plants with Dipel, put fresh wood ashes around each plant, and made sure I let the birds know how much I appreciated all they did in the garden. I don’t do much for them, except provide water, but they do so much for me! Particularly, the wonderful little Chipping Sparrows. Either the timing was right, the weather was right, what I did was right, the birds had some good feasts, or the borers decided to bore elsewhere. Anyway, I didn’t have any more damage and ended up with a decent crop of corn, though the maturity was more variable than usual. We ate a lot of fresh corn, dried a good amount of green corn, and harvested enough good dry ears in the fall for seed. There were a lot of corn worms and I killed many of them on the silks, keeping an eye out for them whenever walking by the corn. I planted half my corn in plots of 4 rows, the other half in plots with two rows of corn and two of beans. The 4 row plots were somewhat better and easier to manage. Since I almost always end up having to cover the beans because of late frosts, having half the plot in corn didn’t work very well. I'll keep the two separate in the future. I again had a good amount of stem borer activity and damage in my sweet corn, and handled it the same as last year (Dipel and wood ashes). In addition, I planted two seeds per spot and let them grow later than I usually do without thinning. Quite often one had damage but not the other, so I pulled up the damaged plants and composted them. This worked quite well and I ended up with somewhat fewer plants but a decent crop. Next year I’m going to pull the mulch off the plot when I plant then leave it bare for a time to give the birds a better chance at the worms, putting the mulch back when the plants are up and growing well. The corn made it through the many frosts with surprisingly little damage, though maturity of ears was widely variable, I assume because of the less than ideal continual wet weather. We had many summer meals of corn and I dried an adequate supply of green corn (which is never quite enough when winter comes!). I've pretty much settled on a good corn routine for my garden that's working well. Rake the mulch off the corn plots early so the soil can warm and the birds can harvest any corn eating insects they can find. Plant two seeds per spot the end of May, four rows per 4' wide plot, 12" apart; then a second planting mid June. When the plants are about 6" tall, thin to one plant every 12" (approx), pulling plants that show signs of stem borers (indicated by an even row of usually 4 squarish holes in leaves) and generally the weaker or less robust looking of the two. If I'm going to save seed, I mark with clothespins the earliest and best looking ears, at least 50, to leave to mature for seed. This way, I don't have to stop and think about each ear before picking green. I just have to resolve not to pick those beautiful ears marked for seed. It's worth it in future crops. 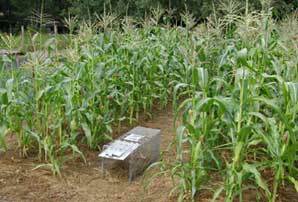 Note to myself: Remember to put the electric fence up around the corn BEFORE the first ears ripen, don't wait for the raccoons to let me know when the first corn is at its peak (though they are better at knowing that than I am). Eat as much fresh green corn as we can when its ready, dry the rest, and enjoy, with great appreciation, it all. Chop the stalks down in pieces with long handled loppers when the fruit has been harvested, thereby making it easier to see what stalks still have ears. Plus the stalks rot better and are easier to manage the following year (than when the stalks are left whole). What a great crop corn is. And I love the diversity in my crop, both the sweet and the flour. It seems to enjoy itself, and we certainly enjoy it. I realized I hadn't added anything to this page in quite awhile. But in reading through what has gone before there simply isn't much to add! I'm still growing the same sweet corn mix, the same way, saving seed now and then when my supply gets low. The seed lasts so well and so long that it isn't very often; the last save (2014) was seven years after the previous and still germinating well. It gets better every time though as I select once again for the plants and ears that grow best in my garden. It's been a long time now since I've had stem borer problems and the crops have been good, some better some less depending on the weather but always we have corn. This year was a record warm, long season for us and the best ever harvest. My corn may put up with the colder, shorter years but it obviously much prefers a little more heat! And it got it this year. We ate well in season and had plenty to dry for winter. It gets added to cook with the luncheon salad rice as well as into the many winter soups, adding both color, flavor, and nutrition. It is a much appreciated crop. 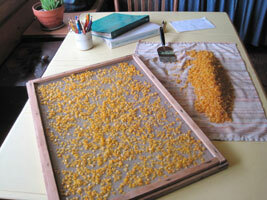 We've had a real nice sweet corn crop this year and I've dried several good batches. Today the last large harvest went in the dryer. There are still some ears out there, mostly smalls and seconds, so we'll have a few more good meals and one more dried batch. We love sweet corn fresh but the season is rather short so most of my corn is preserved for later eating. And my favorite way to store it is dried. I harvest it as one does for fresh eating: husk and steam the ears (about 10 minutes), cut the kernals off the cob, then spread on the dryer screen and out in the solar dryer it goes. This requires several good sunny days to get it properly dried so it's sometimes a challenge to get it all coordinated between ripeness, weather, and our schedule (will I be home at the right time). If it gets a good drying day then it can wait inside on the holding racks for a day or two before going back out. But there have been years when the weather just didn't cooperate and I had to dry the harvest inside on the cookstove. It works but takes a lot more attention to keep from burning it. But this year I've managed to hit the right days at the right time and the jars of beautiful dried kernals are multiplying, dried in our much appreciated solar food dryer. The dried corn smells wonderful when you open the jar, and is easy to cook. Just cover with water, soak a bit then simmer for a short time. It comes out very near to fresh tasting! I also toss some in winter soups. But probably the way I use it the most is to include a handful when cooking rice. It adds both flavor and visual appeal.